An estimated 300 premature deaths were associated with a serious UK air pollution episode in 2014, parliament has been told. The figure represents twice the deaths attributed to particulate pollution when it is at typical spring levels. It is theoretical and does not equate to the deaths of specific people but is a way of quantifying the estimated mortality risk as a proportion of the population. It comes after the government was criticised for “criminal neglect” over its response during a week of high pollution in December. Baroness Jenny Jones, who had requested the information in parliament, said the government had put out “the minimum of information” about the incident and had relied too heavily on Twitter to publicise it. Air quality experts said that the research by Public Health England and the Met Office are “important” and should prompt debate about how the UK deals with short-term episodes of high pollution. In 2014 David Cameron dismissed the pollution event as a “naturally occurring weather phenomenon”, prompting a scathing critique from the European Commission. A scientific paper has since concluded that while dust blown in from the Sahara desert played a part, the episode was mostly due to fertilisers on farms and industry in mainland Europe. Media reports have suggested it was the worst pollution episode in the UK in a decade. Levels of the particulate PM2.5 were recorded at up to 83 μg m3 over ten days in March and April 2014, leading the environment department and the Met Office to recommend people stay indoors. The World Health Organisation recommends that levels should not exceed an average of 25 μg m3 over any one given day and states that there is “no threshold” of PM2.5 that is not damaging to human health. The research, published in the journal Environment International last year, shows that over the ten days, an estimated total of 600 deaths were “brought forward”, but 300 of these would have been expected with average spring levels of PM2.5. The researchers used air quality data to compare PM2.5 levels with those recorded in other typical years and then used data from health impact assessments about the mortality effect of short-term exposure to PM2.5 to come up with the figure. They also used other mortality and public health data to exclude other health variables that would affect mortality rates. The research does not quantify the amount of time lives were shortened by but says that the deaths were “brought forward”. “This paper is an important one in my view. There aren’t many studies on the effects of smog episodes in the UK. Most studies focus on the everyday exposure to air pollution rather the shorter smog periods. Fuller added that the research that followed the Great London Smog of 1952 paved the way for the 1956 Clean Air Act. Pollution episodes have been linked with increased cardiovascular and respiratory problems, including asthma. This can lead to an increased risk of death and hospitalisation and poses particular risks to the young, the aged and those with pre-existing health conditions. Comparisons have been drawn recently between measures taken to deal with pollution episodes in London and in other cities, particularly in Europe. During an episode in Paris in December, citizens were offered free use of public transport, while the use of cars was rationed on the streets. Such emergency measures have not been taken in the UK. Long-term exposure to air pollution also comes with a death toll. The European Environment Agency attributes 37,800 and 14,100 deaths to PM2.5 and nitrogen dioxide pollution respectively. Road transport is the foremost contributor to London’s long-term air pollution problem, with diesel vehicles responsible for close to 40% of PM10 and NOx emissions. Mayors in Paris, Madrid, Athens and Mexico City have recently pledged to ban diesel vehicles by 2025. 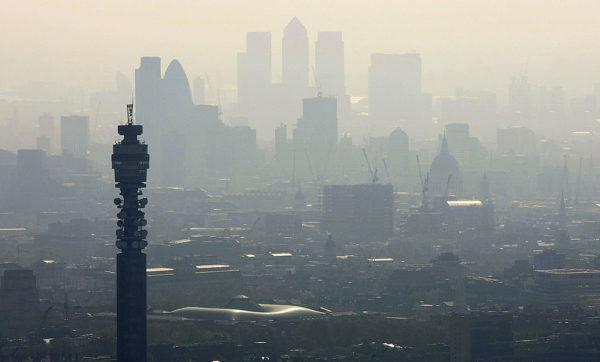 The government is currently reviewing its air quality plans after the High Court ruled them to be illegal in November. A spokesperson from the Department for Environment, Food and Rural Affairs said: “We are firmly committed to improving the UK’s air quality and cutting harmful emissions. That’s why we have committed more than £2billion since 2011 to increase the uptake of ultra-low emissions vehicles, support greener transport schemes and set out how we will improve air quality through a new programme of Clean Air Zones. Analysis: Could VW’s emission violations cause hundreds of extra deaths from air pollution?